Get fresh-baked bread on the table without the hassle with our exclusive multi-use dough mix—just add yeast and water. Bake it as it is, or add your favorite seasonings for tasty arti­san loaves. Plus, you can use the dough for rolls, scones, pizza crust, doughnuts, cinnamon rolls, and more! ENRICHED UNBLEACHED WHEAT FLOUR (NIACIN, REDUCED IRON, THIAMINE MONONITRATE, RIBOFLAVIN, FOLIC ACID, ENZYMES), SKIM MILK, HONEY CRYSTALS (REFINERY SUGAR, HONEY), SHORTENING POWDER (SOYBEAN OIL, MALTODEXTRIN, SODIUM CASEINATE, MONO AND DIGLYCERIDES, AND DISODIUM PHOSPHATE), SALT, WHOLE EGGS, YOLK, EGG WHITES (GLUCOSE REMOVED FOR STABILITY), DOUGH ENHANCER (WHEAT FLOUR, CALCIUM SULFATE, AND 2% OR LESS ENZYMES). CONTAINS: WHEAT, EGG, MILK, SOY. Remove oxygen absorber from can. Add 1 cup plus 2 tbsp. warm water to mixer with dough hook. 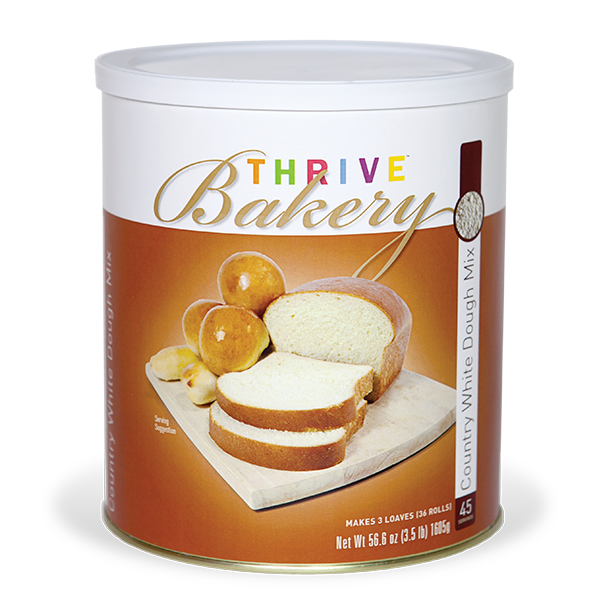 Add 2 1/4 tsp [1 packet] THRIVE Instant Dry Yeast and slowly add 3 3/4 cups bread mix, stirring occasionally. Knead 5 minutes on medium speed or until gluten is formed. Form into a smooth ball and lightly cover with oil. Cover with plastic wrap and allow to rise until doubled in size (about 40 minutes]. Form dough into a loaf and place In greased 9x5 loaf pan. Let rise until dough rises over top of pan [about 1 hour]. Score bread if desired. Bake at 350°F for 30-35 minutes or until golden brown. For rolls, roll the dough into 12 smaII balls and cook for only 12-15 minutes. The dough is a no-brainer for pizza crust, scones, doughnuts, cinnamon rolls, and more.